Even a hydraulics company needs a lift sometimes and the Mallard team was happy to provide the perfect pallet flow configuration for the ride. As far as tests and applications go, this one was pretty simple… but it’s the “storage method vs gravity flow configuration” that we thought was important enough to share. As you can see from our test video the inventory was stored in totes. Normally, we steer our customers to one of our carton flow applications when they are using totes, but in this case the totes weighed-in at 200 lbs. each… which exceeds the limit for carton flow; therefore, pallet flow was the right gravity flow solution. 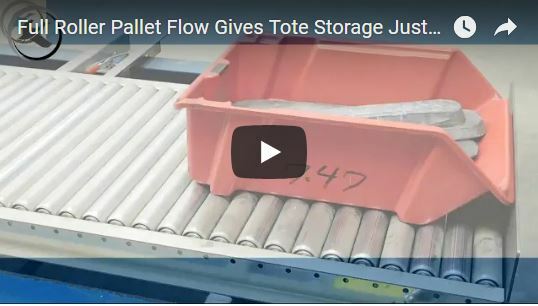 Full-roller pallet flow is very useful in tote applications where the inventory weight exceeds recommended limits for carton flow rack. The totes provided for this test were flat-bottomed which allowed for good contact with the rollers and a consistent flow down the lane. As is often the case, the Engineering Lab tested two lane configurations to determine if there was a preferable solution. The first test was with 1.9” diameter rollers set closely together on 2” centers. The second test was 1.9” diameter rollers set on 4” centers. The 4” centers have more room between the rollers therefore provide less coverage along the bottom of the tote as it progresses down lane. The question was, will the totes perform consistently with fewer rollers? In both applications, the totes flowed consistently and without hang ups to the end of the lane. However, when the front tote was picked, the two lane configurations had different restart results. The totes in the lane on 2” centers automatically restarted and filled the pick face. The totes in the second test, however, had trouble restarting on their own to flow forward and fill the open pick face. So, while the totes flowed well to the end of the lane initially there simply wasn’t enough coverage to automatically restart the rear totes and advance them down the lane once they’d come to a stop. Note, the totes were easily restarted by hand, so this application could work, but since the 2” center configuration didn’t show any hang-up issues, the Mallard team recommended the 2” center configuration as the more reliable and efficient solution. The only accessory added to the lane configuration was a custom end-stop. The end-stop was customized to ensure it was tall enough to engage the lip of the tote that protruded out from the front several inches. The end-stop was attached to the lane below the rollers leaving the sides unattached. This design allowed for it to absorb the impact with a little “spring” and ensure a softer landing at the front of the lane for the heavy totes. 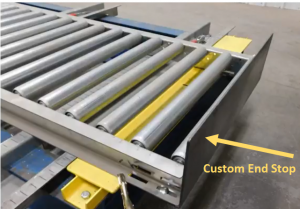 While the test video shows a standard roller width for this lane configuration, the lane that will be installed for the customer will closely match the width of the totes to maximize space and provide good tracking. 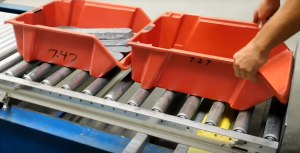 Full-roller pallet flow is available for frame dimensions from 4” – 60” wide. Where could your processing use a lift? The gravity flow experts are on hand to discuss your warehousing needs and goals… what’s working and what just isn’t. Give us a call and let’s see if gravity can be put to work for you.